Junipers, as with most bonsai, like to be watered every two days as a rule. Feel the soil every day. Stick your finger about a half of an inch to an inch into the soil. If the soil feels dry, water your bonsai. Never let your bonsai go completely dry for extended periods!!! The best way to water a bonsai tree is by pouring water evenly over the entire surface soil until it begins to drain out of the bottom of the pot. Then, wait about a half hour and water again in the same manner. Let all excess water drain out of the pot before returning your bonsai tree to its tray. Water every two days, place in a bright location but protected from direct sunlight, normal household temeratures. Fertilize May to October using 30-30-30 or Schultz liquid. We are on 808 York Mills Rd at Leslie St ( in the Longo's Plaza ). Bonsai from the Japanese bon or tray sai planting. This is a cascade style. Any and all Bonsai are mainly used for the pleasure of watching something grow. The thrill you experience when a new leaf or new growth is present is very rewarding. Now you can have a cup of tea and contemplate your , " tree. " 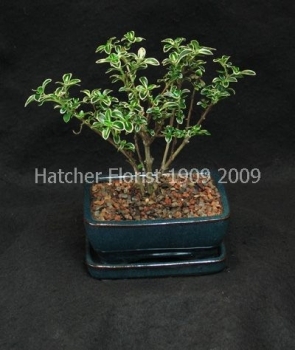 See all our Bonsai selections here.